Rainy weather is expected on November 9. Torrential rain is expected in some places at night and in the morning. North-west wind will blow. The temperature on the peninsula will be +8-10˚C at night, +14-16˚C in the afternoon in Absheron peninsula and Baku, the Ecology and Natural Resources Ministry reported. Atmospheric pressure will be 767 mm; relative humidity will be 80-90%. The weather will be mainly rainless in country's regions. However, rain is expected in Lankaran-Astara zone at times. It will be intensive in some places. Fog will be observed in some places in the morning. East wind will blow. The temperature will be +7-11˚C at night, +13-18˚C in daytime, -3+2˚C in mountains at night, +4-9˚C in daytime. 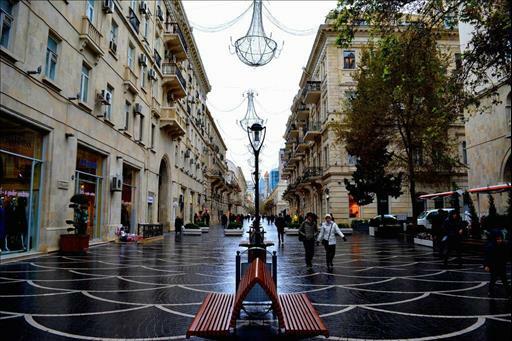 Rainy weather conditions in Baku and Absheron peninsula will continue until November 9. Torrential rain is expected in some places at night and in the morning.